John L Handcox, poet, folksinger, and union organizer, was born near Brinkley, Arkansas, on February 5, 1904 to parents George and Vina Handcox. John began picking cotton at age six. He gained some education in a rural one-room school for African Americans but learned to read and rhyme words from a book of poems by Paul Lawrence Dunbar given to him by his father. At the age of 19 John took over the small Handcox holdings and tenant farm lands after a runaway mule threw his father from a buckboard and broke his neck in 1923. He tried to keep the large Handcox family — John had ten brothers and sisters — intact but hard times in Arkansas cotton country in the 1920s, compounded by the iron grip on the county’s black and white population by the white plantation oligarchy, broke up the family and dragged the Handcoxes into poverty. The Handcox family lost their land and by the early 1930s survived mainly as sharecroppers, as New Deal agricultural policies and the Great Depression drove hundreds of thousands of tenants and sharecroppers across the Mid-South from the land. Some moved to cities like Memphis, Chicago, and St. Louis, but others became migrating rural wage laborers. In the midst of this economic chaos, John Handcox joined the Southern Tenant Farmers’ Union (STFU), organized in 1934 by Socialist Party leaders and a small group of black and white sharecroppers, tenant farmers, and wage laborers. Handcox and other union members defied planters, terrorist organizations such as the Ku Klux Klan, and southern racial etiquette by holding unsegregated interracial conventions and mass meetings. The STFU held a successful surprise strike of cotton pickers during the 1935 harvest season, leading to nearly 30,000 people joining the union in Arkansas, Missouri, Oklahoma, and Texas. 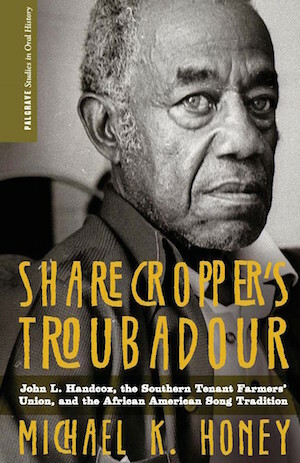 Handcox quit sharecropping in 1935, selling fish and popcorn on the plantations to make a living while secretly collecting union dues. He became the union’s leading songwriter-poet and a union organizer until the threat of a lynch mob drove him from Arkansas in 1937. Handcox became a familiar figure in Northern union and civil rights circles, using his songs and poems to describe the plight of southern agricultural workers to sympathetic audiences in New York City, Chicago, and Detroit. Meantime, racial violence, and planter and state repression destroyed the STFU. It could no longer afford to pay him as an organizer and he was blacklisted by employers in Arkansas. He and his family moved to Oklahoma around 1940 and in 1942 Handcox moved to San Diego, California, as part of a second great migration of southerners to west coast war production centers. For the next 50 years he practically vanished from the historical record. In 1967 Pete Seeger, Woody Guthrie, and Alan Lomax published a music collection called Hard-Hitting Songs for Hard-Hit People, which highlighted several of Handcox’s songs and poems. Seeger tried to find John Handcox and presumed him dead even as he helped introduce the Arkansas union organizer’s poetry and music to a new generation of Americans. In 1982, John Handcox attended and sang at a gathering in Memphis commemorating nearly 50 years since the founding of the Southern Tenant Farmers’ Union. In 1985, Pete Seeger, aided by Ralph Rinzler at the Smithsonian Institution, brought John Handcox to a gathering of younger labor singers at the Great Labor Arts Exchange in Silver Spring, Maryland. The 81 year-old John Handcox began touring again, singing the songs and reciting the poems that had made him a successful union organizer in the Arkansas Delta in the 1930s. Handcox continued to perform until his death in San Diego at age 88 on September 18, 1992. Michael K. Honey, Sharecropper’s Troubadour: John L. Handcox, the Southern Tenant Farmers’ Union, and the African American Song Tradition (Palgrave MacMillan oral history series, 2013); and John L. Handcox: Songs, Poems, and Stories of the Southern Tenant Farmers, compact disc 978-0-937058-90-9 compiled by Mark Allen Jackson (West Virginia University Press, c. 2004).